Steve Rogers was a shorter-than-average kid from Brooklyn who just wanted to fight in the Second World War. After being rejected multiple times, Steve volunteered to have an experimental super-serum injected into him. If the serum worked, it would be applied to a whole army of men to make them taller, faster and stronger than any man alive. But that was not to be. The scientist who succeeded in turning Steve into a super-soldier was assassinated moments after Steve’s transformation. The secret was lost forever and Steve Rogers became Captain America, America’s only super- soldier. Captain America was created by Joe Simon in 1940. He sketched the character in costume and called him Super American, but soon changed it to Captain America, because there were already too many "Supers" around. After Joe got his partner, cartoonist Jack Kirby on board, Captain America’s first issue (Captain America Comics #1) was released in March 1941 through Timely Comics. It was several months before the U.S. declared war on Japan and entered World War II. Once the U.S. declared war, Cap’s popularity skyrocketed. Captain America comics became so popular that they were soon selling more than a million copies per month. Everybody in the United States knew who Captain America was. Captain America comics were cheap and easy to ship, which made them ideal reading material for the homesick G.I.s overseas. The comics provided troops with entertainment as well as a boost to their morale. Once the war was over, the Captain retired... or so we believed. The Joe McCarthy anti-Communist sentiments of the 1950s forced Captain America back into service as a "Commie Smasher." Now Captain America was fighting a different kind of Red Skull. Unsurprisingly, children were not impressed with McCarthyism in their comic books and by the mid-1950s Captain America was shelved. A movie was made in 1990, but when the studio saw the finished product they didn't like it. It went direct to video. When Steve Rogers died in 2007 in the Marvel comics, his friend Bucky became the new Captain America. This was part of The Death of Captain America series written by Ed Brubaker with art by Steve Epting. Steve is tragically killed by Sharon Carter, whose mind is under the influence of Hydra. Bucky takes on the role of Captain America and vows to kill Tony Stark. Fans of the comics were elated when Cap was revived in the six-issue comic book series Captain America: Reborn. Sharon Carter's shot didn't kill Steve Rogers. Instead, it sent his spirit through various moments in Steve's life until he returned to the present. And that brings us to the present-day Marvel Cinematic Universe incarnation of Captain America. Chris Evans dons the shield in the 2011 movie Captain America: The First Avenger. Director Joe Johnson, along with writers Christopher Markus and Stephen McFeely chose to go against the trend of gritty comic book movies. Instead they followed Iron Man’s footsteps and gave audiences a fun, mostly light-hearted movie about good vs. evil. "Realism" be damned. It was a smart move. The film takes place in World War II, and making the film too realistic and gritty would have been painful. Instead of going the Saving Private Ryan route of trying to show what World War II was actually like, the movie is written, shot and color corrected to feel like the 1940s. In other words, if filmmakers from the '40s were to make a Captain America movie with 21st century technology, The First Avenger would be it. When the 2014 sequel Captain America: The Winter Soldier was released, many called it not only the best Captain America film, but the best superhero film of all time. Captain America discovers that his government, the very body that gave him his life and purpose, is morally questionable. The film deals with government surveillance and the release of secret government information. The decision to do this in light of the Edward Snowden controversy was hailed by critics and audiences. 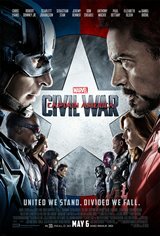 Chris Evan’s Captain America then appeared in 2015’s The Avengers: Age of Ultron, but it was Captain America: Civil War that received even better reviews and greater box office success than The Winter Soldier. It seems that Cap can do no wrong. Captain America has come a long way. He’s gone through many incarnations, and each sought to reflect the American identity at that particular point in time. Cap is in many ways a periodical of American culture in the 20th and 21st centuries. If history does inevitably repeat itself then perhaps I can offer the Marvel Cinematic Universe a glimpse into the future.